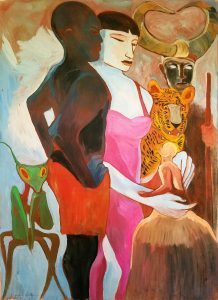 PATON MILLER’s painting for the poster (above) shows the white woman, her servant, the shaman and the spirit child, along with the leopard and praying mantis that have important roles. Thanks to Paton for this vibrant and eloquent image that boldly captures the essence of the poem. In 2016, I found myself writing an epic poem – something that I have never before attempted, but it became the mythical story of a white woman, her African servant and a shaman who manipulates events so that the woman and her servant end up making a “spirit child” out of clay. It took me some time to understand the sources of this story. At first, I thought it was a true original – something that just burst forth from my ceaseless brain. But on looking back, I realize that I have addressed the relationship between white woman and African servant in Colonial Kenya several times in my written work. For example, there is a short story in my book AFRICA JUU which details the servant’s intimacy with his employer’s underwear, since he must wash and iron it. That custom was a source of great embarrassment to me as a teenager, and lo and behold, that has become a seminal scene in NAISULA. There is also a story of the loving relationship between a white man and an African woman being ripped to shreds by the man’s English mother, who simply cannot contain her racial hatred. Then there is the book I wrote that was never published – once again, addressing the dissembling appearance of the relationship between a white woman on her farm and the African gardener. Growing up in Kenya during the Colonial period, I was often exposed to the awful composite of white adults assuming financial responsibility for an African servant and his family, but basically treating him or her with disrespect, sarcasm and impatience. The Africans were definitely “lesser” beings. At the same time, many White Kenyans absorbed elements of African culture, and it was not at all unusual for a European to seek help from a shaman or “witch doctor” as they were called then. This, too, has become a crucial element in NAISULA. These racial disparities bothered me so much that I left Kenya when I was 23, uneasy with my place in that society. Some of my work since then has been an attempt to analyze my own role, and that of my family, during the fascinating period when the nation was preparing to break away from British rule; social taboos were breaking down; and we were on the cusp of true racial integration. When I visit Kenya today, more than 50 years later, I am thrilled to note that social integration has indeed taken root and that most of the social taboos I experienced are no longer evident. You may wonder why I chose the name NAISULA . Some time last year, I bought a painting by Beth O’Donnell that I absolutely had to have. It is a photograph of a Samburu woman from northern Kenya, taken in the 1970s. She stares proudly out at the camera, wrinkled and dark and adorned with bead necklaces. The artist has used black encaustic slashed with brilliant red to make her even more mysterious and other-worldly. Recently, when my good friend Maasai Chief Nickson Parmisa of Empakasi district in Kenya, came to visit, I asked him to hold a traditional naming ceremony for this woman. Standing in my living room in Sag Harbor, New York, we bowed our heads, sent up a small prayer for her, and in the Maa language, she was named NAISULA – Woman of Power. Nickson Parmisa lives in Kitengela, just a mile or two from Athi River, where I spent my early childhood on my father’s cattle ranch, right in the heart of Maasai land. In conjunction with NAISULA, Nickson has identified a group of Maasai women in Kitengela who are extremely poor but struggle daily to sell their crafts so that they can pay for their daughters’ education. At a small boarding school in the area, the girls learn traditional academic subjects., but in addition, Empakasi School has become a sanctuary for girls who would otherwise have been forced to undergo female genital mutilation, sold off in exchange for livestock or forced into early marriage with much older men. This is why I am donating a portion of all funds raised for my theatrical production to the EMPAKASI SCHOOL in Kitengela. This money will enable the school to host a few more endangered girls and give them the education that they deserve. May they all become NAISULA – WOMEN OF POWER. is dedicated to all women of every color and creed, for we are ALL women of power.